The tenth edition of the HKTDC Hong Kong International Wine & Spirits Fair will open at the Hong Kong Convention and Exhibition Centre tomorrow and continue through 11 November. 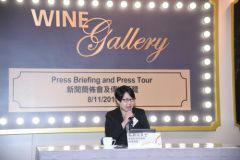 Sophia Chong, HKTDC Assistant Executive Director, announces details of the event at a press briefing today. Today's pre-fair press tour gives media representatives a taste of what to expect during the Wine & Spirits Fair, including award-winning liquors (R) and premium Chardonnay Brandy (L), from the Australia's Royal Agricultural Society of Victoria. 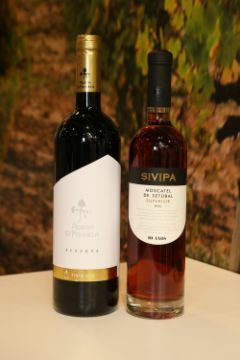 One of the new pavilions, Portugal's Confederacao dos Agricultores de Portugal, brings to the wine fair red wines made from Castelao, a primarily red wine grape, as well as fortified wines. HONG KONG, Nov 8, 2017 - (ACN Newswire) - The tenth HKTDC Hong Kong International Wine & Spirits Fair will open tomorrow (9 November) and continue through 11 November at the Hong Kong Convention and Exhibition Centre (HKCEC). Financial Secretary of the Hong Kong Special Administrative Region (HKSAR) Government, Paul Chan will be the guest of honour at the opening ceremony. This year's Wine & Spirits Fair will showcase fine wine and spirits from a record 1,070 exhibitors from 38 countries and regions. There will be more than 30 group pavilions representing wine-producing regions, trade organisations and governmental organisations from around the world. These include new pavilions organised by France's Syndicat General des Vignerons de la Champagne (SGV), the Southern United States Trade Association, the Russian Export Center, Enterprise Mauritius, Portugal's Confederacao dos Agricultores de Portugal and Setubal Peninsula Wines, as well as Romania's Asociatia Producatorilor si Exportatorilor de Vinuri. Highlight zones such as Wine & Liquor Products and Whisky and Spirits will also be showcased. The HKTDC will organise more than 70 events during the fair to provide the industry with a comprehensive business and intelligence exchange platform. On Saturday (11 November), the fair's Public Day, the show will be open to members of the public aged 18 or above, with tickets available on-site at HK$200. From now until 10 November, Public Day tickets are available at a special price of HK$99 on HOKOBUY, FeedMeGuru, Yahoo, Group Buyer, GOBUYA and HKTVmall. Mobile tickets are also on sale on TNG Wallet. Visitors with valid tickets for that day will receive a Lucaris crystal wine glass on-site on a first-come, first-served basis while stocks last. The groundbreaking Asia Wine Academy will offer two intensive courses at the fair -- "Contemporary Trends in Wine Consumption" and "Mastering Tasting & Rising Wine Trends," which will be conducted by Masters of Wine Jeannie Cho Lee MW and Steve Charters. Participants who complete the courses will be awarded a certificate. Public visitors can enrol at a special price of HK$690 (original price: HK$990) on the Wine & Spirits Fair website, online group-purchase platforms, Timable, Feedme Guru or TNG Wallet. Participants will receive a complimentary Wine & Spirits Fair Public Day ticket and a Lucaris crystal wine glass, valued at a total HK$1,300, on a first-come, first-serve basis while stocks last. Media representatives wishing to cover the event may register on-site with their business cards and/or media identification. Copyright 2017 ACN Newswire . All rights reserved.